Half term is a perfect time to get children into the kitchen and these biscuits are a great place to start. 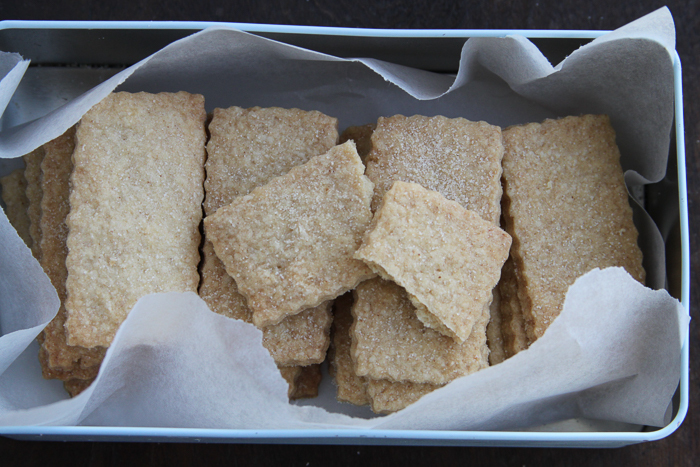 Delicious, crisp, gingery shortbread which are simple to make and employ a useful 3:2:1 ratio in the recipe which is easy to remember and keeps maths in mind even away from school (is that mean of me?). More importantly cooking something from scratch gives children a huge sense of achievement and their pride in themselves as they offer the biscuits to family and friends is worth any mess in the kitchen. I must confess to having a bee in my bonnet about children and cooking. I worry that cooking skills are not being passed on and their importance overlooked. Nutritionally, emotionally and practically, learning to feed yourself well and to cook is essential and yet it doesn’t seem to get the focus I think it deserves. If we don’t teach children how to cook for themselves from raw ingredients then we will raise a generation of microwave cookers. The raw ingredients bit is key here. Anyone can bung a ready made lasagne in the microwave and cook it. All you will end up with though, is, well a lasagne. However, if you take a potato, how many ways are there to cook that? Twenty or thirty possibilities for your dinner present themselves, but, to be fair, you have to learn how to make them, rather than just read timing instructions on a box. There lies your conundrum – potatoes, cheap and accessible but requiring a little attention and knowledge; or a packaged lasagne probably containing preservatives and perhaps more salt and sugar than is advisable, certainly more expensive but easy to heat. So whilst I am not expecting every 10 year old to be able to rustle up a Coq au Vin or a souffle, learning to cook is a life skill and these biscuits are a good place to start. You can leave the ginger out if that is not your thing or alternatively, make the buttermilk scones I wrote about last month. 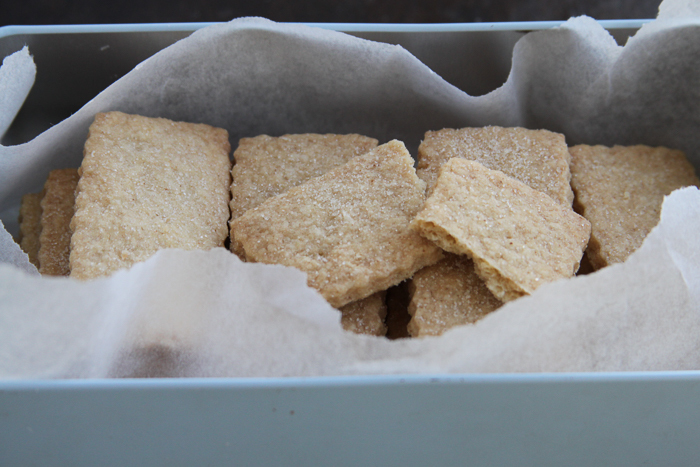 These shortbread are meltingly delicious so make some for those times when you need to sit down with a cup of tea and something sweet to settle your nerves and it is too early for gin – after all it is half term. This is a pretty straightforward recipe using 150g flour, 100g butter and 50g sugar but I like to use 100g plain flour and 50g of cornflour to ensure that crispness. If you don’t have any cornflour they will still work well with 150g plain flour. Preheat the oven to 170. Cream the butter, sugar and salt together. You can do this by hand or in a stand mixer. Then add the flours and ginger and mix until it forms a ball of dough. Roll out on a lightly floured surface and cut out whatever shapes you like and place on a baking sheet lined with baking parchment. Sprinkle lightly with caster sugar and then bake in the middle of the oven until golden, about 12-15 minutes but keep an eye on them. Makes about 20 depending on the size of your biscuits.